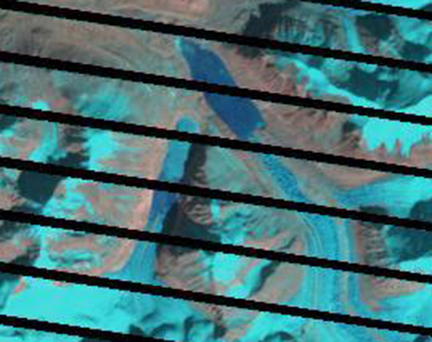 A comparison of imagery from 1989 to 2009 indicates an expansion of Longbasba Lake, a moraine dammed lake in Tibet (Yao et al, 2012). 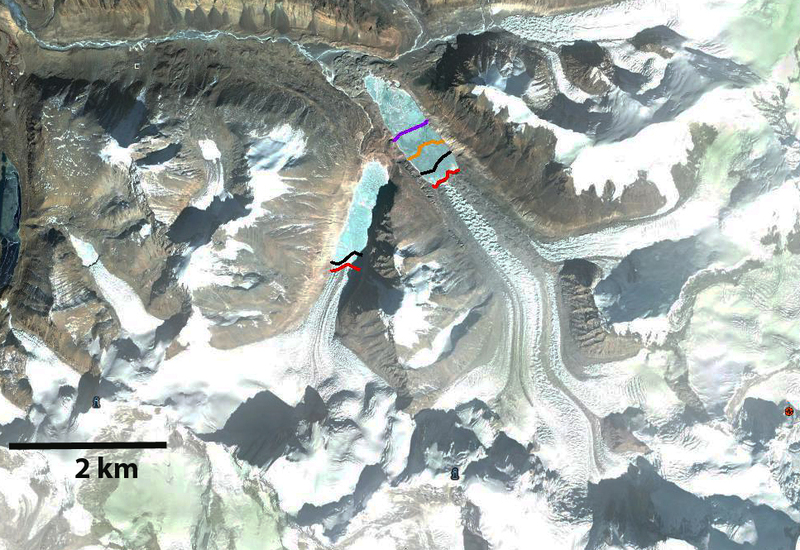 The Longbasba Glacier has retreated 950 meters 1989-2009 and as the depth has increased the volume has quadrupled to 1.3 cubic kilometers (Yao et al, 2012). The concern is to the 23 villages downstream of the lake and the Rongkong Hydropower station. 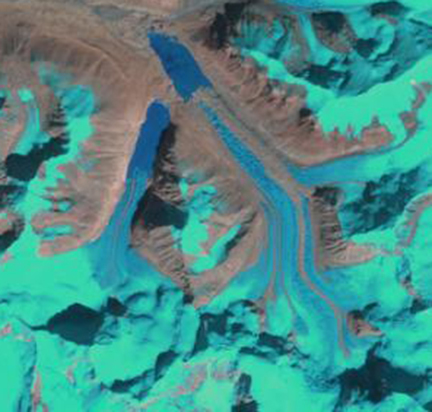 In this post we compare Landsat imagery from 1989, 2000 and 2011 and Google Earth imagery from 2006 and 2010 to identify changes in the terminus position of the glacier and the lake size. Longbasba Lake is near the top trending northwest to the west is a north trending Pida Lake. The lake is quite small in 1989, and more than doubles in length by 2011 with a retreat of the glacier of 1050 m. The terminus positions of the glacier are purple for 1989, orange for 2000, black for 2006 and red for 2011. The 2006 image also indicates the snowline on the glacier which is at 6300 meters. 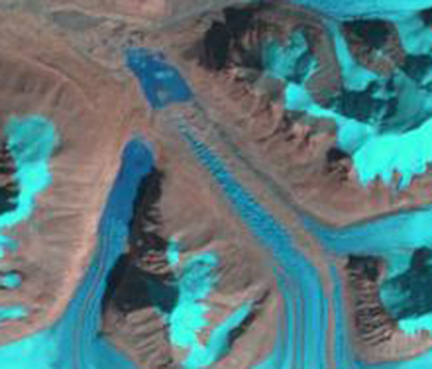 The glacier is following the pattern of Theri Kang Glacier, Reqiang Glacier and North Lhonak Glacier. 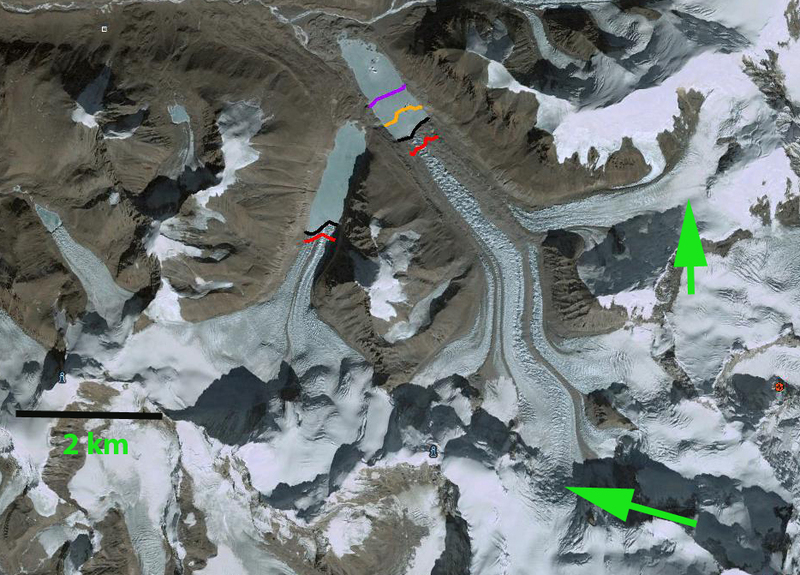 This entry was posted in Glacier Observations and tagged longbasba glacier retreat, Longbasba lake expansion. Bookmark the permalink.